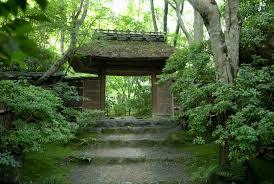 Giouji Temple is a quiet temple surrounded by trees and a luxuriant moss garden. 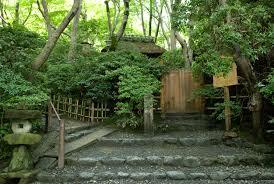 The trees grow quite densely, and the temple is often covered in deep shade. Inside the temple, however, is a statue of Dainichi Nyorai, the Buddha of Light. Other statues are connected to the temple's place in Japanese history and literature. The temple was named after Gio, a dancer from long ago who fell in love with the Heike Clan's powerful leader Taira-no-Kiyomori. When he ended their relationship, Gio retreated to this temple to spend the rest of her life as a Buddhist priestess, along with her sister, mother, and another of Kiyomori's spurned lovers. Wooden statues of the women and Kiyomori are enshrined in the main hall. The temple grounds are especially beautiful in autumn, when the leaves change colors and stand in sharp contrast to the green moss.